October 13-19, 2013 is Teen Read Week, a national adolescent literacy initiative created by the Young Adult Library Services Association (YALSA) to encourage teens to be regular readers and library users. OPL has a bunch of fun teen events planned at various branches (although not at Montclair) – see their website for a complete list. 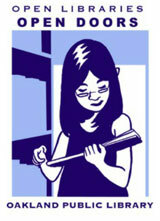 In fact, OPL has a special section of their website just for teens: Visit http://oaklandlibrary.org/teens for a test prep help list, resources for staying healthy, jobs, scholarships, contests, events, reading recommendations and more. Teens can vote in the Teens Top Ten from YALSA and DogoBooks, where teens nominate and choose their favorite books of the previous year.